Following on yesterday’s release by the European Broadcasting Union of the total jury and televote scores for countries in the two semi finals and the final and the release of detailed jury vote details for a number of countries including Ireland (as discussed in an earlier post), the United Kingdom today released its jury vote details for the second semi final and the final. 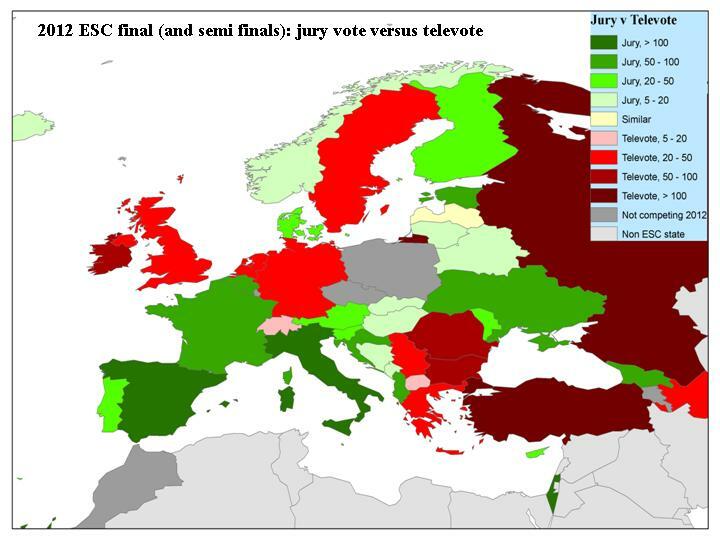 While the United Kingdom jury was not in a position to vote for Ireland in the semi final (as Jedward took part in Semi Final 1), the United Kingdom jury decided not to award Jedward any points in the Final, instead giving their higher marks to Spain, Estonia and Malta. 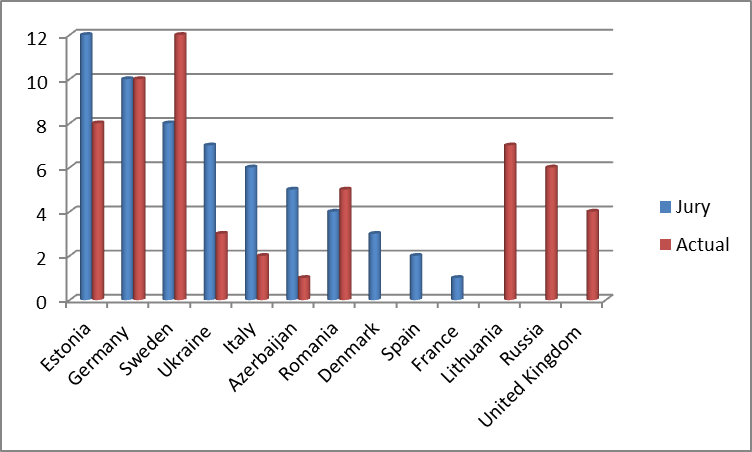 A comparison between the jury vote and the actual (combined televote/jury vote) scores from the United Kingdom wouldhowever suggest that Jedward probably got the douze points mark from the United Kingdom televote (Figure 1) and that countries such as Turkey and Lithuania also scored well in the United Kingdom televote. 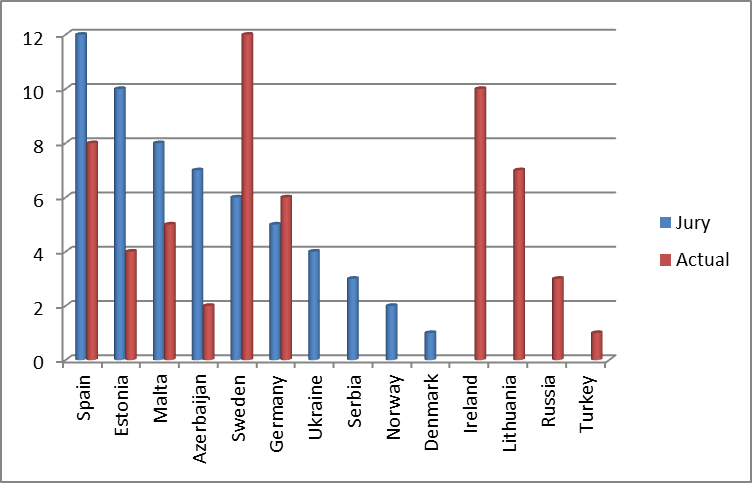 Eurovision Song Contest 2012 – How did the Irish jury vote in the Final and Semi Final? The German Eurovision website, eurovision.de, has today revealed how the Irish Eurovision jury voted in this year’s semi final and final and throws up some interesting trends. 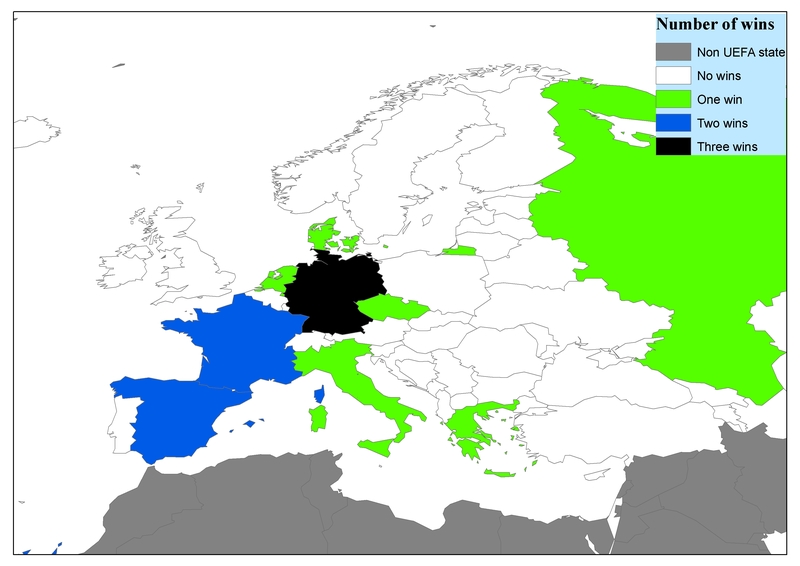 What country has the best record in the European (Soccer) Championships? Hint – it’s the Germans!